This story is about a girl called Tilly whose mother died just after her sixth birthday and Tilly is now seven and a half. Tilly's dad, however, is very-much alive and is an inventor and happens to create a time machine! Tilly and her dad have always wanted to travel back to her 6th birthday to when Tilly's mummy was still alive!!! But Tilly's dad is lost in time, so she travels back in time to save her dad! Will she or will she not save her dad and meet her mum once more? When Tilly enters the time machine, she meets lots of historical characters such as, Admiral Nelson, Hans (the famous football payer) in 1966 and Queen Victoria. I liked the part where Tilly has afternoon tea with Queen Victoria in Buckingham Palace and learns that Queen Victoria loved Afternoon Tea and had a husband called Prince Albert who was born on the 26th August 1819 and died 14th December 1861. Tilly also meets a boy called Jack and she goes chimney sweeping at the palace with him. I also favour the part where Tilly ends up in Digby Snottington's office, who is not my favourite character, and happens to adjust his email. She also travels back in time to discover a cupboard full of her mummy's old photos in her dad's office. This book was easy to read and full of interesting history. An amusing book that made me laugh out loud, a great read! I enjoyed the book as it is very factual and I enjoyed finding out facts from the past. My favourite character was Tilly's dad as he was crazy and always knew his time machine would work. I also enjoyed the parts set in the Victorian era and I would like to find out more about that time. I enjoyed this book and I particularly liked the Thrax character and I thought the history was realistic. Although this book was a bit to long for me I would still consider reading other books by the same author because I did enjoy it. I thought that the book was really good because it made me believe I was actually time travelling back in time: to Queen Victoria's time, the football match against West Germany, the battle against the French and Tilly's 6th birthday to see her mummy. My favourite part of this book was when Tilly fell down the chimney and covered Queen Victoria in soot and ashes but the whole book itself was amazing! The history book was very like time back then but I'm not sure the queen would have eaten sausages on sticks. Now I want to read more of Adrian Emondson's books! A good part of the book was when Tilly had Victorian Day and she wore the dress that Queen Victoria gave her and won first place. I also liked the part where Tilly's friend Jack dressed up as her friend Jack from the past (the chimney sweep). I didn't dislike the book in any way - everything was top class! There was quite a lot of history in the book because she travelled back in time and every time she pressed GO it took her to a new place that her dad had typed in to the computer. I thought that this book was amazing. My special character was Tilly. I really liked the event when Tilly had afternoon tea with Queen Victoria. In the book I felt that the history was real. This book helped me to understand more about war and I would really like to read more books by this author. The bit that I found really funny was when Tilly pretends to be the police! I think the author (Adrian Edmonson) really thought about the book and it's really impressive to know so much history. It made me want to visit queen Victoria and show her a lovely tasty Bangladeshi dish (from where I come from) and get her opinion. This book was so exciting I couldn't put it down! I particularly liked the part where Tilly met Queen Victoria because Queen Victoria ate so fast and Tilly only managed to eat one macaroon. It was really funny. The history was realistic to me so it has made me wan to find out more. I like the author Adrian Edmondson and if I liked the sound of the next story I would love to read another of his books. Tilly and the time machine is a great story but also really sad how her mum dies. Her dad (the one who created the time machine)always gets sad when Tilly brings her mum up . I just love it how Tilly is able to time travel .After I read it I had to see who the author was and see if he had any other books . I recommend this book to anyone above 6, I'm sure you will love it! My favourite book character in Tilly and the Time Machine was Tilly because she is brave and very funny. I really enjoyed the book because it is packed full of lots of different adventures. I would really like to read more books by this author. I enjoyed the book because it was funny but informal at the same time. My favourite character was Tilly because she is hilarious and silly. My favourite time period she visited was the Victorian times. My favourite event was when Tilly shouted, 'Mydar-Lingju-lia- my darling Julia'. I think the most realistic part was the Victorian era. I like they there is a lot of drama because first her mum dies then she loses her dad and so it's quite dramatic. I like the part where her dad is a talking dog and he makes the time-machine. I really enjoyed this. I sometimes give up half way through chapter books but I read every word. I've got 3 favourite bits, The first bit is when she looked out of her window when her dad had a called her and he said something like I've just made a time machine. The second bit was where she jumped out of the window and her dad catches her. Second when she was at school and a drew what queen Victoria would have eaten for afternoon tea. When she went back in time to her sixth birthdays party and she saw her mum. 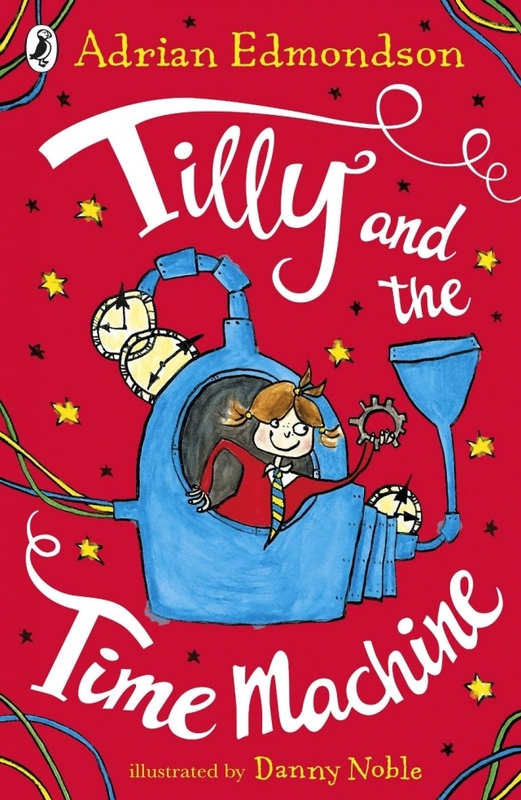 What the book is about: The book is about a girl called Tilly and her dad who makes a time-machine. Tilly is really excited and she longs for a go in it. She wants to go back in time to her 6th birthday, as her mum was alive then (Tilly's mum has died of cancer.) Then the time-machine breaks, and Tilly's dad gets lost in time! It happens when Tilly is asleep, and she over-sleeps as her dad usually wakes her up in the morning. Her dad isn't there to make her a packed-lunch for school so Tilly has to make one herself (her packed-lunch is just chocolate-digestives.) At the end of the day, Tilly slips away from school and when she gets home again, she checks in the house and in the shed for her dad. He isn't there. She tests out the time machine by going back in time to her school. When she goes back to the present time she watches some TV and relaxes a bit. In the evening, Tilly notices some men trying to get into the garden and she realises that they are trying to steal the time-machine!!!! She then slips into the garden and goes back in time to try and stop the men from getting over the garden-fence. She comes up with a plan, and when the men arrive they can't get into the garden! One of the things delaying them is a big box of fireworks. They're accidentally set off and the men run away in fright. Unfortunately, the time-machine breaks, and Tilly gets lost in time! She travels through a whole load of different time-periods, changing them as goes. Can she find her dad and get back home again? Find out in this really funny book. What I like about the book: My favourite bits in the book are when Tilly meets Admiral Nelson and when she also time-travels to her dad's old work. The bit when she meets Admiral Nelson is really funny, because when Nelson gets shot the Captain of the ship bends down and Nelson speaks to him. What he actually says is, 'Kiss me Hardy' but Tilly hears, 'Pass me a KitKat Hardy' and I find that bit really funny! The other funny bit is when Tilly time-travels to her dad's old work place and she finds herself in the office of the Head of the department! Tilly edits a letter that the Head of the department has written. It ends up saying something quite different instead. Tilly then prints the letter and folds it up ready to be sent off. That bit is just as good as the Admiral Nelson bit! I think this book is written for 7, 8, 9, 10 year olds.Â It's really funny and really good. It includes facts about Nelson, Queen Victoria, and the World Cup in 1966 when England won! It also has a history quiz at the end of the book which is really fun! Overall, I think this book is really funny, and I really enjoyed reading it. I loved the book. I loved how the author described the different places she went to. The characters that were in the book were described very well especially Tilly's mum and Tilly herself. I think that the history was realistic. The time machine of course isn't real, but if someone younger was reading it then it would be appropriate and would expand their imagination. This made me want to find more about the author and the history in the book. I loved how Tilly was on a mission as well as it being this being about history. This is a clever technique for learning history while reading a book. So well done to the author. I really enjoyed this book. I thought that the main character Tilly was good because she is exciting and brave. I liked the part in the book when they went to Buckingham Palace and they met Queen Victoria for a tea party. I think the history in the book was real as some of the places are real buildings. The book made me want to find out more about the history of Buckingham Palace. This is Adrian Edmonson's first book that he has written for children, I do hope that he writes some more books. I enjoyed the book because it was based on facts. I liked the bit where Tilly got shoved up the chimney. I thought the fact that Queen Victoria wore black for the rest of her life after her husband Albert died was an interesting historical fact. After reading this book I wanted to find out more about history. In the future I will be looking for other books written by this author. I liked the pictures in this book because I thought it made it easier to understand the story. I so enjoyed this book I read it very quickly as I found I didnâ€™t want to put it down. I really enjoyed the book, it was very exciting.Â I liked Tilly and thought she was very special and she went on lots of adventures back in time. I particularly liked it when she went back to Victorian Times and met Queen Victoria and had afternoon tea â€“ that was really good. It did make me want to read more about Victoria Times and the story and I thought the story was very imaginative and funny. I want to read more books by the author because I think this book is really good and its made me want to read more of his stories.Â The language used by the author was funny, especially the song â€œshake your bum aroundâ€ and the language was descriptive and realistic when describing the olden days. I liked the emotion in it because Tilly wants to see her mum Julia and I was hopeful she would be able to find her with the Time Machine and I really enjoyed doing the Time Traveller Trivia quiz at the back of the book too with my Mum. This was a great way to learn about the Victorians. There are interesting facts just like a normal history book but you find them out as part of time travelling story instead so it makes it more interesting. It also has good characters to and you want to know more about Tilly. I like the way that the book has been written. The author writes in a way and uses words that young people would want to read. This book is excellent! It tells you a lot about the Victorian times and their way of life. I have found out that the Victorians had been living a lot different to how we live now. They drink with their pinky finger up. They had very beautiful clothes to wear (if they were royal or rich) and lots more. My favorite character is Tilly. She is also the main person and loves a good adventure. Her mum sadly died when she was seven. So when her dad builds a time machine, he travels to her six birthday and saw her mummy. She didn't realise that he'd gone until she woke up one morning. She looked at her picture(of her mummy, her daddy and her) and she realized, on her fridge (in the background) was writing and so it told her what to type in to the time machine, so eventually she was at her six birthday. The book is very inspiring to make people want know about the Victorians times and want to be an author about Victorians. This book is realistic and tells you a lot of interesting facts about the Victorian times and how they ate. It defiantly inspirers me to want to know about history. This author is an amazing author; I have loved reading this book and will definitely read more. This book is good for children who like history or would like to know more history facts. This book will tell you all about the Victorians and everything they did that is different to how we would do it. This book is very imaginative with the time machine that Tillyâ€™s dad makes. I would definitely say this is one of the best books I have ever read. I think that Adrian Edmonson is a very inspiring author and makes young people want to be an author.